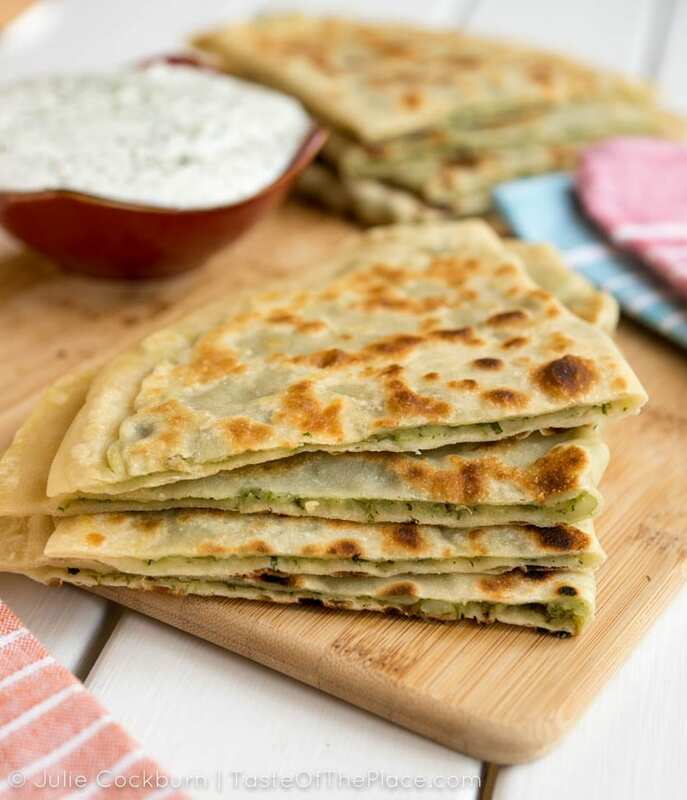 Savory veggies stuffed inside a crispy, yet tender flatbread – yes, please! This recipe from Afghanistan is a fun and flavor filled street food called bolani. Serve them up as a light entree, side for a soup or salad, or pack them up for lunch or a picnic. Don’t you just love street food?! It’s fast food the way it should be – real ingredients, cooked by real people, making tried and true recipes adored by millions. 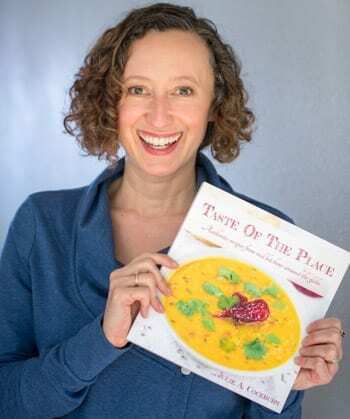 In my humble opinion, exploring the street food scene is one of the best ways to get a feel for whatever new country or area you may be visiting – it gives you a vibrant glimpse into the flavors, culture, and people that are at the heart of a place. These filling suggestions are just the beginning! Stuff your bolani with whatever suits your fancy. I’ve seen particularly tasty looking recipes stuffed with sweet potatoes, and another filled almost entirely with leeks – yumm! These are my potato stuffed bolani. I personally like the spinach filling a bit more, but there are pretty darn tasty, too! To save time, you could make and refrigerate all the parts ahead of time. Just pull your dough out of the fridge to rest at room temperature for about 45 minutes before rolling it out and putting everything together. 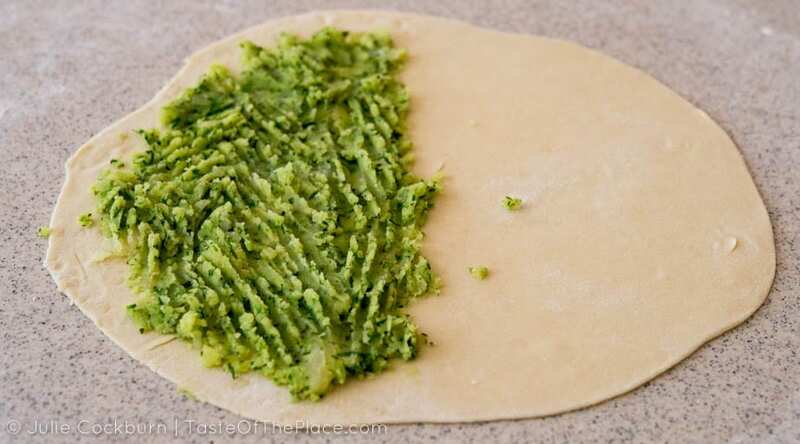 Speaking of dough – be sure to roll your dough into thin disks, as round as you can get them. Aim for making them about 8 inches wide. Much bigger, and they will be too thin to hold the filling. Much smaller, and the dough will be too thick and chewy. When you fill the dough, just add a thin layer to half. I have found that a generous 1/3 of a cup is perfect. Spread it evenly with a fork or a spoon. 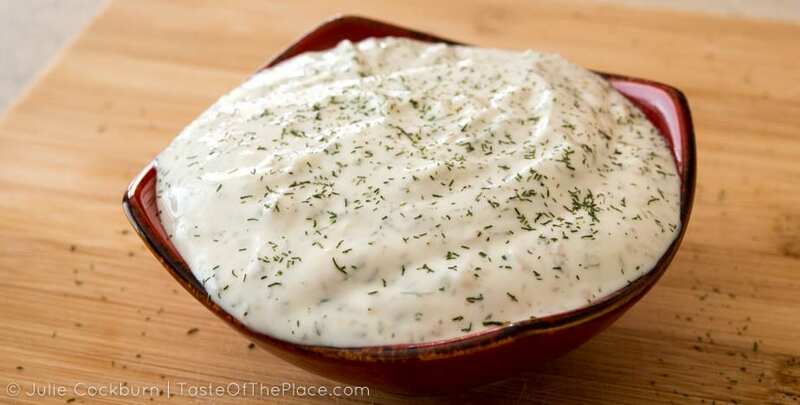 Don’t skip the yogurt sauce! 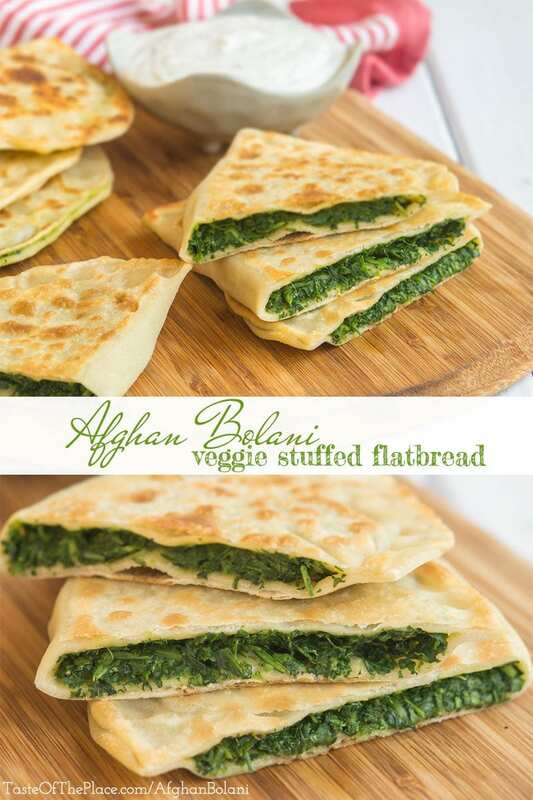 It’s that garlicky, zingy flavor that really makes these bolani shine! 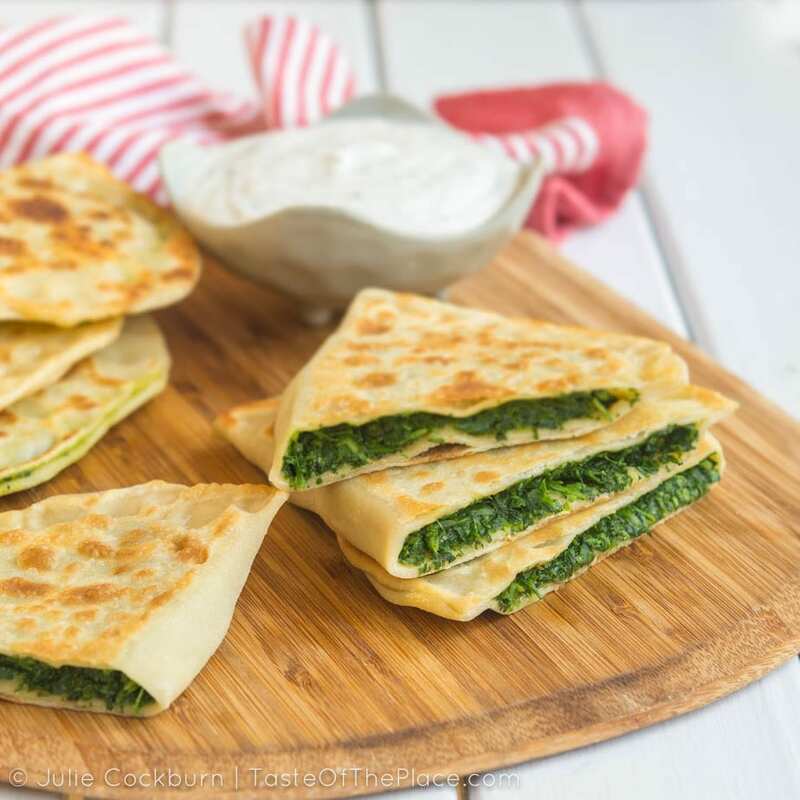 Savory veggies stuffed inside a crispy, yet tender flatbread - yes, please! This recipe from Afghanistan is a fun and flavor filled street food called bolani. Serve them up as a light entree, side for a soup or salad, or pack them up for lunch or a picnic. Whisk together the yogurt, garlic, ground coriander seeds, dill, and a pinch of salt. Whisk in 2 tablespoons of water, adding additional water as needed to reach a smooth consistency, perfect for dipping. Taste for salt, adding more if desired. Set aside, allowing the flavors to combine, while you prepare the bolani. Whisk the flour, salt, and 1 tablespoon of the olive oil together in a large bowl. Set the remaining 2 tablespoons of olive oil aside for brushing on the bolani later. Use a fork or your fingers to mix in ¾ cup of water. Begin to knead the dough, adding additional water a splash at a time as needed, until it comes together. If your dough becomes sticky, add a dusting of flour. Continue kneading for about 8 minutes, until the dough is smooth and soft. Cover with a lightly dampened towel, and set aside to rest for 20 minutes. Blanch the spinach. I like to do this by placing the spinach in a large colander in the sink, and pouring boiling water over the top until the leaves are just wilted. Drain well, pressing as much extra water from the spinach as you can. Using a food processor (you can do this with a knife, too, but a food processor makes quick work of it. If you do use a knife, add the olive oil in at the end, along with the salt and pepper), pulse the cilantro, green onions, jalapeño, and 1 tablespoon olive oil a few times until the veggies are finely minced. Add the spinach to the food processor, a couple handfuls at a time, and pulse until everything is minced and well combined. Mix in salt and freshly ground pepper to taste. Don’t be shy here - spinach can be quite bland without enough seasoning. Add a few good pinches, give it a taste, and add more if needed. If your mixture seems really wet, place in a colander to drain while you roll out the dough. Lightly mash the potatoes so they are mostly smooth, with a few small chunks. Using a food processor or a knife, pulse or finely mince the cilantro, green onions, and jalapeño together. In a large bowl, combine the cilantro mix with the potatoes, 2 tablespoons olive oil, and salt and pepper to taste. Don’t be shy with the seasoning - not using enough will leave the filling bland, so add a few good pinches, give it a taste, and add more as needed. On a floured work surface, roll each piece into a thin round about 8 inches across. Keep covered under a slightly damp towel until ready to stuff. If you stack your dough rounds while working, be sure they are well dusted with flour, or they’ll tend to stick together. Spread a generous ⅓ cup of filling on half of each round, leaving a border along the edge for sealing. 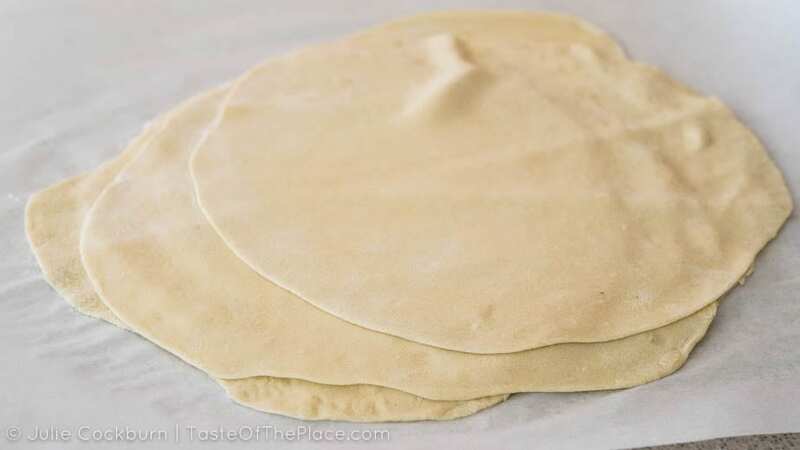 Fold the dough over, making a half-circle shape, and gently press the surface to remove any big air pockets. Press the edges together to seal. Set aside under a slightly damp towel until ready to fry. Heat a 10 inch skillet or a griddle over medium. You’ll know it’s hot enough when a drop of water dances and sizzles across the surface. Generously brush one side of one bolani with some of the reserved olive oil. Place oil side down on the hot skillet, and fry until golden brown. Brush the second side with oil, flip, and cook until golden brown and delicious. Set aside, lightly covered with foil or a towel to keep warm, and repeat with the remaining bolani. These filling suggestions are just the beginning! 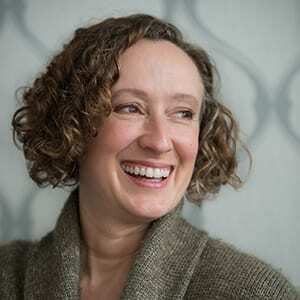 Stuff your bolani with whatever suites your fancy. I’ve seen particularly tasty looking recipes stuffed with sweet potatoes - yumm! Be sure to roll your dough into thin disks, as round as you can get them. Aim for making them about 8 inches wide. Much bigger, and they will be too thin to hold the filling. Much smaller, and the dough will be too thick and chewy. When you fill the dough, just add a thin layer to half. I have found that a generous ⅓ of a cup is perfect. Spread it evenly with a fork or a spoon.